It’s the last week of March and it’s again been more than five months since I last posted to this blog. I just don’t know where the time goes. I’m as busy as I’ve ever been, and yet I feel like I’m accomplishing less. Perhaps it’s a function of age – everything seems to take longer the older I get. Or maybe it’s a function of the increasingly higher standards I set for myself. For example, last month I gave two lectures to the current class of Master Gardener students. One of these was a full day design presentation – a talk I’d given (in some form or another) dozens of times and to a variety of audiences. It gets tweaked each time – compressed or expanded depending on the audience, but this time I ended up rebuilding the whole damn thing! Why? Well, as I reviewed my PowerPoint slides I found myself scoffing at everything; the photos looked unprofessional, the font was dated, the animation amateurish… and so a ‘tweak’ became a major reconstruction. I was relatively happy with the finished product, but I don’t know if it was worth the several all-nighters I pulled to get it done (staying up all night was way easier, and waaaay more fun, in my twenties than in my fifties). And in the end, did I actually impart any more, or any better information to the students? Who knows? I do know though, that perfectionism isn’t always in one’s best interest. Because now I am sick. Not deathly ill, but miserable enough that I don’t feel like doing much of anything. So loyal readers, it seems my misfortune is your good fortune since the one thing I do feel up to, is writing. In fact it just might make me feel better. If you remember my last post (it was so long ago, I barely remember) we examined the relationship between colour and various aspects of human perception – more specifically, how the former can impact the latter. Continuing with this exploration then, let’s look at some of the ways our visual perception can in turn affect and distort colour. Understanding various visual mechanisms – ways our vision adapts and adjusts – is a key piece of the garden colour puzzle. For the most part, our eyes successfully adapt to ever-changing visual data, allowing us to maintain a stable and consistent interpretation of the world around us. We know that an object appearing smaller from across a room is the same size regardless of where we view it from, or that the darker colour created by a shadow doesn’t change the actual colour of an object. We know these things without even thinking about them – unless we are trying to draw or paint said objects. Sometimes though, this ‘constancy apparatus’ fails and our eyes make erroneous adjustments. Four such adjustments are commonly experienced; Simultaneous Contrast, Successive Contrast, Colour Assimilation and Colour Separation. Today we’ll look at the first two of these visual phenomena. Adjacent colours interact with one another other in a most curious way – actually changing the appearance of each other; an effect known as Simultaneous Contrast. Of course this phenomenon isn’t due to any magical properties the colours possess; rather the adjustments are taking place within our own visual system as it attempts to decipher and differentiate that which it sees by accentuating colour differences. All three colour attributes can be influenced by neighbouring colours, the effect being most noticeable when one colour is completely surrounded by another. So what is actually happening here? Are our eyes just playing tricks on us? Well yes in fact they are. As I mentioned before, one of the ways our eyes recognize and discriminate between adjacent colours is by accentuating their differences, and in so doing, imbues each colour with traits of the other colour’s opposite. Yikes, that was a mouthful wasn’t it? Maybe I can better explain with some examples. In the first example below, a magenta-coloured square is surrounded by a green square on the left and an orange square on the right – we can all agree it doesn’t look like the same magenta, right? (I assure you it is though). Our eyes acknowledge the green then ‘over-differentiate’ and induce green’s opposite hue, red, which then mixes with the magenta, making it appear warmer – hot pink even. The orange square on the other hand stimulates our eyes to add its opposite, blue, thus creating a cooler looking purple-pink. Another way to think of it is that colours will shift in hue, value and saturation away from those of the surrounding colour. Because the magenta square is smaller and completely enveloped in another colour it has little effect on those surrounding colours. Simultaneous Contrast of Hue – note how the hue of the smaller square appears different depending on the background colour. Graphics: Sue Gaviller. The next example shows Simultaneous Contrast as it relates to Value alone. On the left a medium gray square is enclosed on a background of darker charcoal gray, and on the right the same medium gray is surrounded by lighter gray. Again our vision discriminates between the darker gray and the medium gray by overstating the lightness of the medium gray (left). Likewise our eyes discriminate between the lighter gray and the medium gray by overstating the darkness of the medium gray (right). In the third example the smaller square is a red of medium to low saturation, but its saturation seems to strengthen as its background colour weakens. It is difficult to illustrate this effect with garden photographs – photos can deceive, particularly where colour is concerned. Perceived hue differences (or lack thereof) could thus be the fault of the photo and not a real representation of what is happening in the garden. And the degree to which Simultaneous Contrast is seen in the garden is less than one might think – there are many other factors at play, for example; weather changes, seasonal changes, daily sun movements, and even the amount of particulate matter in the air, can all affect lighting conditions, which in turn affect the colours we observe. Colour is reflected from other objects and surfaces too, thus altering hue perception, and the constant presence of unifying green can mitigate various colour illusions. Nevertheless we do witness Simultaneous Contrast in our gardens and landscapes, though it is more subtle than squares of colour on a computer monitor. The effect, especially where hue is concerned, is most noticeable when two adjacent hues present as solid blocks of uninterrupted colour. Of course plants don’t always present this way since foliage, flower petals, stamens etc. are often different colours, which means colours will intermingle (this can produce yet another effect, one I will look at in my next post). Tertiary or intermediate colours (red-violet, blue-green, etc.) will be influenced to a greater degree by their surroundings than basic or primary hues because their make-up is more complex. Simultaneous Contrast is the reason two complementary colours, when used together, create such a forceful pairing – they increase the intensity of each other. Think about it; each colour bestows upon the other, the traits of its own opposite – which is the other colour. A double dose of each! Another visual effect related to Simultaneous Contrast is Successive Contrast – the best way to demonstrate this effect is to try the following: stare at the coloured circle below for 30 to 60 seconds, then immediately turn your gaze to a blank piece of white paper. What do you see? If you don’t see anything, try again. And if you have any serious eye condition or disease, you might want to avoid this exercise altogether. When you look at the white paper after staring at the green circle, you should see a circle of the same size in a light reddish pink colour – this is called an afterimage. Let’s try another one. Stare at the orange circle below for half-a-minute or so then look at the white piece of paper again. So what colour did y’all see this time? Light bluish right? We see this afterimage because the eye’s receptors for a particular color become desensitized to it, or more accurately, the receptors for the other colours become more sensitive – hence we see the perceptual complement of the colour we’ve just been staring at. The afterimage will dissipate shortly, its duration proportionate to the length of time you viewed the original colour and the intensity (saturation) of that colour. Now try looking at each of the circles again, but this time when you avert your gaze, instead of focusing on the white paper, look towards a different coloured background. What do you notice? The colour of the afterimage should now blend with the new colour you are looking at. You can see where this might come into play in the garden – look at the following garden image for at least 30 seconds then at the white paper again. Do you experience the same effect? The two previous images should produce afterimages the same size and shape as the photo images, in colours opposite to the predominant colour in the photos. Now see what happens when you look at one of them for a bit, then the other right after – how do they affect each other. What about the next image – how does staring at each of the previous two photos affect the way you see the colour of the Rudbeckia in the following photo? The effect here will likely be muted – in fact you may have to do this exercise a few times before you recognize it. And because the effect is fleeting, its implications in the garden environs are limited. Large swaths of colour are more likely to produce afterimage effect because you will look at them for longer – all in all the experience of afterimages distorting the visual experience of successive plant colours, will at most be intermittent. However, learning to recognize this phenomenon, as well as Simultaneous Contrast, affords the gardener one more advantage in working with colour in the garden. We’ll look at two more interesting colour effects in my next post. Well whaddya know? I feel much better. Now if only pretty plants and pretty colours could heal our hurting world…. Greetings loyal readers. It seems I haven’t published a post in more than 5 months. I guess time flies when you’re having fun… or when you’re really busy. And a very busy summer it has been, both personally and professionally. Thanks to all who keep visiting here despite the lack of new content. So to get back to where we were a loooong time ago, let’s continue with our study of colour in the garden. It’s time to take all that technical stuff about Hue, Value & Saturation and put it to work for you. The interaction between colour and human perception is two-way – colour can influence perception, and perception can influence how we see colour. Today we’ll look at a couple of ways colour can affect perception and how this might be utilized in our gardens. According to Encarta Dictionary, the psychological definition of perception is “any neurological process of acquiring and mentally interpreting information from the senses.” It is the interpreting of this information that makes colour a useful tool. Looking out my window one morning last week, I saw blue-grey haze. Acrid smoke from distant forest fires filled the air, prompting air quality advisories and recommending folks stay inside. When I did venture outside briefly, I was surprised at how warm it was – the smoky, blue-grey light made it appear much cooler. Later that same day, as increasingly more smoke particles refracted what light could pierce the smoke, a reddish-orange light was cast over everything – I stepped outside again, this time anticipating oppressive heat, but it wasn’t as warm as I’d expected. Both scenarios came about because my brain incorrectly interpreted the information my eyes had gathered – I expected coolness when the light wavelengths were in a cooler range, and warmth when longer wavelengths prevailed. Indeed we may actually feel cooler in the presence of cool colours, and warmer in the presence of warm colours. Those of you who live in colder climates have no doubt had the experience of looking out the window on a frigid winter day and feeling warmed to the core at the sight of a bright yellow sun. This phenomenon can be exploited in the garden – perhaps you look out your window on a too-cool spring day and your whole being longs for the warmth of summer. Your eyes look toward your garden and espy drifts of orange tulips, yellow primrose and warm pink azalea – and you feel instantly warm. Or maybe you are sitting in your garden on a smoldering hot summer afternoon and note the swaths of soft mauve Russian sage, cool blue Delphinium and violet-blue globe thistle – how cool it feels. Warm hues make cool spring days feel balmy and bright. On the other hand, maybe you like the coolness of spring and choose to accentuate this with the use of cool springtime hues – bright blue forget-me-nots, lilac-pink rock cress, mauve tulips and rich purple dwarf iris. And for those who like it hot, summer’s heat can be turned up a notch by using plants that bloom warm colours in midsummer – bright golden Rudbeckia, mahogany-red Helenium, warm pink Echinacea, and a sprinkling of hot lime-green foliage. Remember though, that abundant warm colours in the garden still require lots of green – enough to balance and counteract the bright reds, oranges and yellows. Visual design often involves a bit of trickery – ways of deceiving the eye to see something that isn’t altogether accurate. For example, in the urban setting many of us reside, yards are often small and disproportionately shaped. The designer’s challenge is to create a sense of spaciousness and pleasing proportion. Understanding the nuances of colour and using it effectively is one way we can achieve this. If you recall from earlier posts in this series, warm colours appear closer than they really are, as do high value colours and those that are highly saturated. Likewise, cool colours, as well as those of low value and/or low saturation, appear further away. This optical illusion can be used to elongate a short flat space or shorten a long narrow space. Since all three colour attributes come into play here, it isn’t always possible to predict how the eye will perceive a particular colour. For example, cool colours tend to recede and high value colours appear to advance – so a pastel mauve might do either depending on the colours that surround it. In the image below – one of many Joseph Alber’s paintings paying homage to ‘the square’ – the black central area at first appears to recede. The mauve area however, appears to alternately approach and retreat, thus bringing the black square forward then back. For any given colour to provide the desired depth illusion, you must consider its context, i.e. its relationship to other nearby colours. A warm hue will appear closer to the viewer when contrasted with a cool hue of equal or lower value and saturation, but further away when contrasted with another warm hue of greater saturation and/or higher value. And although cool colours usually appear to recede, a cool colour that is high value will advance if contrasted with a low value colour of the same hue and equal or less saturation. So how do we use all of this to our benefit in the garden? If the colour of an object causes it to appear further away, placing this colour at the far end of a short flat space might serve to visually elongate the space – additionally, by contrasting this with the use of advancing colours on the side borders, the disproportionate width may appear compressed. Likewise, a long narrow space can be shortened and widened by placing advancing colours at the far end and receding colours on the lateral boundaries. The effect is subtle – colour is by no means the primary cue whereby we perceive depth – but when combined with other forms of ‘forced perspective’, a strong impression of distance or closeness can be implied. Viewing the two images side by side, the effect is more obvious, albeit still subtle. The perception that some colours advance and others recede, isn’t an experience shared by everyone, particularly the warm vs. cool dichotomy – indeed there are those who don’t experience this phenomenon at all, as well as those who actually see the reverse of what most people see. It can also vary within the same individual, dependent on numerous factors; for example, the effect is much less apparent if the two contrasting colours (warm and cool) are viewed against a very light background. Age too, can dictate how colour affects our perception. It’s all about the physics of vision. Yawn. Physics – I had the dullest, most boring, uninspiring, high school physics teacher ever. Last period of the day. Double yawn. But I digress. To put it in simplest terms, it has to do with light rays of differing wavelengths and where they refract and converge on our retinas. Regardless, one thing is certain; colour – with its countless combinations of warm or cool, light or dark, and muted or vibrant – affects us all in subtle ways we aren’t even aware of. In my next post I’ll look at how our perception, in turn, affects the way we see colour. Ha! You thought this post was going be about the tawdry exploits of Anastasia Steele and Christian Grey didn’t you? Tsk, tsk, naughty gardeners. Sorry all you lusty ladies, but this post is literally about the (more than) fifty shades of gray… and brown. Gray and brown; the dull drab colours of a lifeless winter landscape. Haven’t we seen enough of those – do we really need to discuss them on the pages of this usually-colourful blog? Well yes I’m afraid we do – for a number of reasons. While true achromatic grays are rarely seen, if at all, in plant life (more likely gray-green or blue-gray), we do see browns and beiges – in tree bark and branches, seed heads, dying foliage, ornamental grasses and sedges, and even a few flowers. Grays and browns comprise much of the background colour our gardens are seen against – soil, mulch, concrete, stone, wood etc. Our homes too, are backdrop to the garden and are often finished with siding, stucco or stone in some version of gray or brown. While it may seem outside the purview of a garden designer to comment on house colour, it’s actually an important consideration in the overall appeal of a garden. Case in point – our house was once painted white and contributed enormously to the midday washed-out appearance of my sun-drenched front garden. After painting the house a soft warm cafe-au-lait, the garden appears much richer, and colours hold up far better in full sun. House colour is of course a very personal choice – my intent here is merely to arm you with a little understanding of browns, beiges and grays to help you make that choice. These colours are what paint companies and fashionistas call ‘neutral’. However, a true neutral is a colour that is entirely without hue – it is achromatic (i.e. white, gray or black). To avoid confusion then, I’ll avoid the use of the word altogether. As we learned in my last post, colours that are completely desaturated – those at the centre of Munsell’s Color Space, have no hue content at all. These grays differ from each other only in value. However, many of the colours we call gray actually still contain trace amounts of hue. This is why it’s so difficult to match grays (white or black for that matter too) – if they have even a little hue and the parent hues are different, the eye will perceive this discrepancy. Munsell’s Grays: each of these colour chips if seen on its own, might appear gray – seen together though it becomes obvious that they aren’t true grays. In fact they represent the first step of saturation for 20 hues at 8 different values. Both of these grays have a value of 5, but the cool gray on the left has its base in a violet hue whereas the warm gray on the right has a parent hue of orange. If on the other hand the grays are of the same hue but different values, the eye will intuitively perceive the consistent underlying hue and experience a unified pairing – the difference will be noted but seen as effective contrast rather than awkward clash. The above grays have the same parent hue – the medium-low value gray on the left and the medium-high on the right are united by this unchanging hue. It’s clear then, that choosing paint colours to accompany that gray vinyl siding on your house, may not be as straightforward as dark gray and lighter gray. If you want contrasting grays, it’s better to maintain a consistent hue and introduce contrast by changing only the value or saturation – otherwise, because the gray has minimal hue content, the eye won’t see colour contrast so much as it will see colour conflict. Left: Gray siding and gray painted stucco have the same hue hence present a cohesive combination. Right: Gray siding and stucco have different underlying hues thus appear less connected. Stone siding, because it has both warm and cool underlying hues, is more forgiving of its accompanying colours – while the warmer gray is still a better match, the cool gray does work. This isn’t to say hue contrast shouldn’t be employed when choosing house colours; indeed it is a common design strategy, but it will be more effectively achieved by the addition of a stronger, somewhat more saturated colour – saturated enough that the eye can perceive it as purposeful contrast rather than ‘oops that’s the wrong colour’. The rusty-brown of cedar shakes and patio pavers, though not fully saturated, has sufficient colour content to provide effective contrast for the warm gray. Keep in mind though, that the stronger the colour the more it will impact your choice of garden colour scheme. A weakly saturated beige or gray requires little consideration here, but a coppery brown, as pictured above, has enough hue content that it must be taken into account when deciding on colours for your garden. Some may think me too conservative in my approach to exterior colour, but my comments on the subject are really only as it pertains to grays and browns (since that is the focus of this post). While we all have our own individual tastes, the more we explore and study colour, the better we are able to discern its subtleties and the nuances that contribute to a colour palette we’re happy with – or unhappy with. Warm grays with a little more hue content, are browns and beiges, the parent hues being red, orange, yellow and sometimes green-yellow or red-violet. Despite their slightly increased saturation, it can still be difficult to discern an underlying hue – choosing the appropriate brown or beige can thus be a challenge. And because they have a bit more colour content, they are also affected more by light conditions. The first day after painting our house that attractive cafe-au-lait colour (the actual name I believe was Beige-Gray), I returned home just before dusk as the last rays of sun were dispersing. To my dismay, as I turned the corner and caught a glimpse of our newly painted house I saw pink – blech! “OMG what have we done?” I thought, then resigned myself to the fact that I’d have to tell hubby to repaint (like that was going to happen). The next day however, it didn’t look so bad – in fact it was exactly how I’d envisioned it when we chose the colour. Relieved, I assumed the paint must’ve just needed to ‘cure’ before presenting its real colour. Of course I know now that the more likely explanation had to do with the colour of the ambient light – evening and early morning light is pink or reddish compared to other times of day when it may be more yellow, white or blue. So how do we choose the right brown or beige? As with grays, maintaining a consistent hue is still the safest choice and therefore my best advice. Easier said than done; since the hues that underlie these colours may not be immediately discernible. Let’s look at a few examples. Below are three different browns, each with a different parent hue – can you determine what the underlying hues are? Click on each one for the answer. Small wonder that there are so many mismatched browns, beiges, tans and taupes – especially in older neighbourhoods where the original exterior colours have long since been covered by the respective paint choices of successive homeowners. A better understanding of why these mismatches occur will help you avoid making the same mistakes. The images below represent 2 different scenarios for house colours and materials. Which one do you think produces a more unified picture? Why? The answer is of course the colour combination on the right in which all colours have the same parent hue. In the image on the left the colours are based in several different hues which results in disunity. 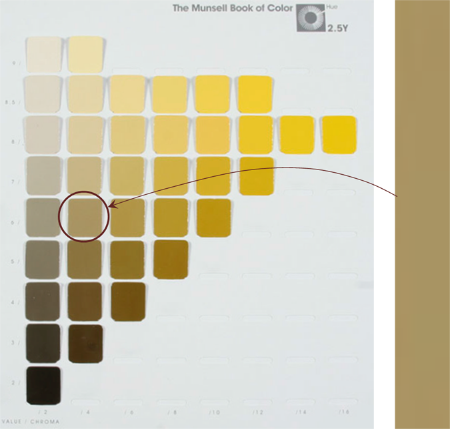 All colours and materials are based in the same orange-yellow hue – Munsell’s 10YR. And what about the garden – need we consider the undertones in the beige or brown colour of our home to make colour choices for the garden? As I mentioned previously, the stronger the colour of one’s house, the more it will factor into the garden colour scheme. However, with weakly saturated browns and beiges, you don’t really need to – they have such low hue content that you can get away with pretty much any colour scheme. But you certainly could – by bringing the same underlying hue from the house into the garden, a deep yet subtle sense of unity is achieved, though the untrained eye may not recognize it, only intuit it. Paint companies don’t always make it easy for us find the right hue – while some organize their paint swatches into strips of 4 or 5 colours in the same hue family, others mix several similar hues within the same strip, leaving you guessing. And even those that use single hue strips, only a small sample of the possible colours within that hue are included. 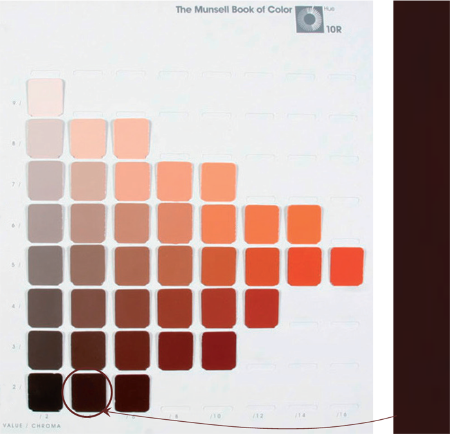 For these reasons I find the hue pages in the Munsell Book of Color to be a most helpful tool – but at $1000.00+ for the book, the cost is prohibitive for most. David Briggs’ Dimensions of Colour: Hue, Value and Chroma – scroll down to the third image, Figure 1.1.3. (wait a few seconds for it to load). Click on the thumbnail of any hue page and it will enlarge. All 40 Munsell hue pages are accessible for your viewing and reference. Classical Lab has developed a Munsell App for iPad and iPhone called MunsellDG. Note: the hue pages differ from the actual Munsell Book of Color due to copyright, but for the purposes of the average gardener or garden designer this is more than enough to help you determine ‘what hue is this?’, ‘what goes with this?’, etc. – and you can take it with you wherever you go. Munsell Color Studies and Art – an interactive website with exercises to test and hone your colour skills. Grays and browns may seem lifeless, especially when spring is so close and an explosion of colour is just around the corner, but understanding these understated colours and learning to see what lies beneath them is one more step towards ‘colouring your garden’ with confidence. It takes practice to see colour in this new way – and I’m not done yet…. Sunlit petals – the imagery evokes such warmth. Indeed there would be no flower petals without sunlight – plants require light to bloom, and light gives the flower (or any object) its colour. In my last post I discussed the attribute of Hue which results from the particular wavelength of that light. In this post I’ll look at Value, which results from the amount of light reflected back from an object. In simpler terms, Value is how light or dark a colour is. If you recall from Part 1 of this series, the value scale is located along the central vertical axis of the Munsell 3D Colour Space. Black is at the bottom of the scale and since it reflects no light, has a value of zero. White, located at the top of the value scale, has the highest value (10) because it reflects the most light – so the darker the colour, the lower the value. Here we start to see colour relationships within a single hue. For instance, maroon, red and pink are all the same hue but at different values, and mauve is the same hue as purple but at a higher value. 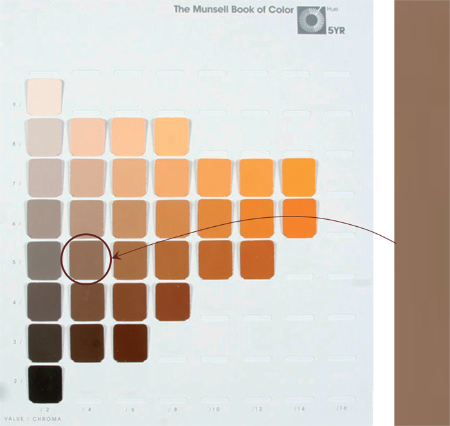 An image from Munsell’s Colour Atlas depicting the basic hues at values from 2 through 8. Colours that have high value, pastels for example, are highly visible because they reflect so much light. Like warm hues, they appear to advance towards the observer, thus seem closer than they really are. For these reasons, plants with pastel colouring provide real ‘pop’ in the garden. And of course for these same reasons, overuse of light bright colours can fatigue the eye. High value colours are especially noticeable in shady locations, at twilight, or against a dark background. On the contrary, these colours get washed out in strong midday sun or near highly reflective surfaces such as concrete or light coloured stone. Left: High value colours, like the pastel mauve of Campanula, appear washed out under strong sun. Right: These same plants seem to glow in the fading light of dusk. Photos: Cathy Gaviller. This washout effect can be minimized with the abundant use of dark green – its lower value helps to absorb reflected light. In fact pastel-coloured plants are at their best when seen against a backdrop of lush green foliage. Panicles of pastel mauve Syringa blossoms are a real standout against dark evergreen foliage. Plants that contain two colours of contrasting value, variegated green and white foliage for example, will appear pastel-coloured when seen from a distance – particularly if the variegations are small. This is called assimilation – the eye optically mixes the colours, averaging the high value of the white and the lower value of the green to make a lighter green. The smaller the variegation the more evident is this effect. In the photo on the right, assimilation is most apparent with the Lamiastrum in the centre – the variegation is barely evident and the leaves appear silvery pastel green. The Hosta in the foreground exhibits no assimilation at all and the Euonymus in the background, only slightly. Low value colours reflect less light than their high value counterparts so are less visible in the landscape, especially in shade, at dusk, or against a dark background. When viewed from a distance, dark-coloured garden elements lose their visual impact and recede into the background, an effect that is compounded by the optical illusion of appearing further away than they actually are. While low value foliage plants (especially dark green) make good garden backdrop, any dark feature you want to draw attention to is best situated close to the viewer, where the deep opulent colour can be appreciated. Dark-coloured plants look exceptional against light-coloured stone, concrete, stucco, etc. and because they absorb light reflected from these surfaces, they also help to reduce glare and the washout effect of midday sun. Since dark colours make good background plantings, and because they don’t draw a lot of attention, they can be used generously in the landscape. But don’t overdo it – too much low value without some medium and higher value to punctuate, will result in a garden composition that feels heavy and sombre. It’s important to note that the basic hues in their pure state don’t have equal values. If I were to pose the question, “Which of the spectral hues has the highest inherent or native value?” you wouldn’t have to think long before responding. You’d answer yellow right? It is obviously the lightest hue on the spectrum. Likewise you would probably intuit that the hue with the lowest natural value is violet or purple. This ranking of hues by value is of particular significance as it relates to colour balance. For example, if you want to use the conventional opposites of violet and yellow you can’t use them in equal proportion – their disparate values will create too much visual tension. I experienced this in my own garden years ago – in my infinite gardener’s wisdom I’d decided I wanted a colour scheme consisting of only purples/violets and yellows. And in my ultimate gardener’s naiveté, I planted an alternating border of pure yellow marigolds and dark purple Lobelia (yes, yes I can hear your snickers and snorts at the mention of such amateur plant choices). It didn’t take long for me to realize how very grating this composition was, although I didn’t know why – I would later learn it takes three or four units of low Value to balance one unit of high Value, and this 3 or 4 to 1 ratio should be applied to violet and yellow. Another way to balance these two hues, and maybe a better way, would be to use darker yellow and lighter violet elements, which lessens the disparity between the two values. They can then be present in more or less equal proportions without the visual discomfort. Value contrast in the garden results from both the strength & direction of sunlight, and from the pigments present in the plants. The sun shining on our gardens creates shadows and highlights that we take very much for granted – we don’t always notice the resultant areas of perceived lighter or darker colour. In fact it is this contrast of light and dark that defines an object in space and enables us to discriminate between like-coloured entities. It’s what allows us to see edges and depth, therefore texture. No one knows this better than the painter – he knows if he is painting a red flower that it involves many variations on red. He adds a little black here, some white there, or grey, thus bringing his 2D image alive. The photographer too, recognizes this – she adjusts her camera settings to compensate for natural lighting that may be less than ideal (well she knows she should, regardless of how finicky and annoying it is). In this way harsh contrast between light and dark can be minimized in her finished product. Using contrasting values of a single hue in a planting composition creates dramatic effect in the garden; indeed nature often does this within a single plant…. Left: soft orange-peach standards and falls are set off by a darker orange beard. Photo: Sue Gaviller Right: velvety purple falls contrast nicely with softer mauve standards. Photo: Pat Gaviller. And the gardener does it within a planting scheme or vignette…. Lovely though these colour combos are, as with almost everything in the garden (and in life), too much of a good thing is… well, too much. Imagine how unpleasant it would be to look at a garden filled with high contrast plant combinations. While value contrast helps us discriminate between the various elements in a planting scheme, it doesn’t always have to be dramatic. And don’t forget balance when contrasting values – use more low value than high value (remember that ratio of 3:1 or 4:1). And green; use lots of it (have I said that before?) – low value green, as well as basic green, which has medium value and helps to balance the higher and lower values. On that note fellow gardeners, I will conclude today’s lesson – hope you’ve learned something of value.